Welcome to week two of my journey through some classic horror films, with this week being the 1984 classic slasher film, Nightmare on Elm Street by Wes Craven. Similar to The Exorcist, I knew a lot about the film but this was my first time actually watching it. Before I was able to watch it however, Deadite had asked me to follow him into his basement. With the quick thought that he might murder me, he instead showed me his impressive collection of Nightmare on Elm Street memorabilia, which includes many figurines, masks, gloves, and a lighter among other things. The best (and he would agree) was his pull string Freddy Krueger doll, which says on the box it’s for children 8 years and up, as the string quotes lines from the film that pretty much says he’s going to kill you. If you ever want to have a great conversation about the Nightmare on Elm Street movies look no further than Deadite. I was able to learn a great deal about this film and the entire series overall as there are nine Nightmare films, with the first one pretty much saving New Line Cinema from going bankrupt. The story is that during filming New Line went two weeks without paying the cast and crew due to lack of funds but the studio today is known as “The House That Freddy Built” and has had major success. Plot: The film begins with Tina Grey (played by Amanda Wyss) waking up from a nightmare in which she is being chased down and attacked by the one and only Freddy Krueger. After talking with her friends Nancy, Glen, and Rod about her nightmare, it starts to come out that they are also having similar nightmares of a disfigured man with a blade-fingernailed glove chasing them and trying to kill them. Unfortunately for Tina, she is murdered after sleeping with Rod and the film shifts to Nancy Thompson as the protagonists of the story as she tries to solve the puzzle of who is hunting her and her friends in their dreams. Nancy later finds out her mother Marge was involved in murdering Freddy Krueger back in the day, as he was found not guilty of child murder charges based on a technicality. It appears Freddy is now out for revenge by going after the parents children. I found this to be a rather neat approach to something that has horrified us all at one time or another in our lives - nightmares. There have been times where we have felt our nightmares were so real and have woken up scared and sweaty; this film takes that fear we have and makes it come to life. The film runs the plot along very smoothly as we see the paranoia rise both from Nancy, her boyfriend Glen and her parents. I also enjoyed how it seemed in the beginning of the film it was going to be about Tina but due to her death Nancy takes over as the main character. It all leads to a great showdown where Nancy is ready to confront Freddy once and for all. I really enjoyed how the film ended where we think the dream is over, but we are led to believe that is not the case. I mean, I’m sure they are fine…. Acting: The movie certainly wasn’t winning any Oscars for acting but the cast is able to deliver in the fact that I was invested in the characters and what their fate would be. Nancy (played by Heather Langenkamp) shows a great amount of fear and then resolve as the film progresses and we truly see how tired and exhausted she is as she keeps fighting sleep knowing she will have to deal with Freddy if she gives in. She takes on an odd leadership role as we see her confronting those who don’t believe her and giving orders to Glen to help her in stopping Freddy. Speaking of Glen, he is played by none other than Johnny Depp in his very first role in a film at 20 years old. Johnny plays the typical 1980’s boyfriend and honestly didn’t do much more for me. My favorite character was Nancy’s mom Marge, who finds the most innovative ways to hide her alcoholism but definitely has her liquor of choice in each scene. The film did a nice job in giving us hints that Marge and her ex-husband Don (played by famous action movie star John Saxton) were hiding something as Nancy kept describing the killer in her dreams. Marge has some great quotes like “they say you’ve bottomed out when you can’t remember the night before” and “I’ve got something better. I’m gonna get her some help”. Finally though, we have Robert Englund who plays Freddy Krueger as one of the most iconic characters in horror film history. It’s a great introduction into the character and Englund does a great job showing us how evil and relentless Freddy is. Suspense: Nightmare on Elm Street offered a little more of what I am looking for in fear and suspense of a horror movie. Showing scenes of Tina and Nancy walking slowly in the dark, smokey boiler room and having Freddy jump out is what I come to expect in a horror film but I would say there could have been a little better production in truly creating a shock to the audience. I would say two times I unexpectedly saw Freddy jump out - from behind Nancy’s bed after she thinks she’s out of the dream and at the very end as he magically defies the law of physics and rips Marge through the door window. 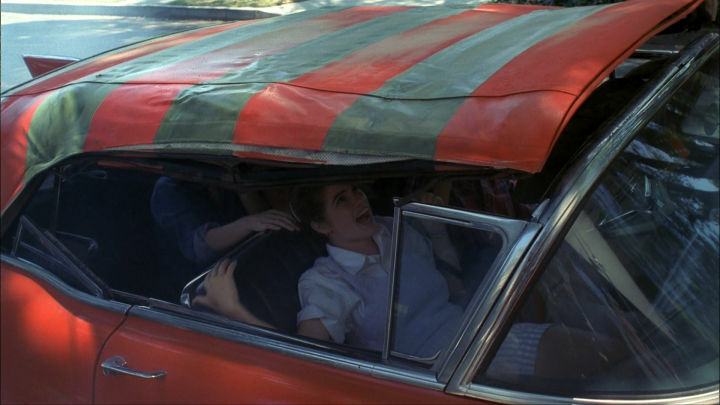 As I mentioned before though, I really did like the ending of the movie as Glen comes to pick up Nancy on their way to school and the top of the convertible is in the colors of Krueger’s sweater and they are locked and trapped inside the car, leaving the audience to decide what their fate will be. Gore/Violence: This is also a little more of what I was expecting out of a horror film. While there are few gory scenes in the film, they certainly leave an impression on you. Tina’s murder is especially gruesome and seeing Rod watch in terror in the corner of the bedroom adds to the insanity of what is happening. Glen’s death is just as good, as we see a waterfall of blood spewing from his bed as he is sucked into the abyss. Deadite had mentioned how in both of those scenes, the director used a revolving room set and had the camera set-up upside down in order to get the shots, which is cool in an era of limited special effects. Other thoughts: I want to add how impressed I was with the use of sound in this film. From the shrieking of Krueger’s blades running across items to the heavy synthesizer and industrial sounding soundtrack, the sounds in the film certainly add excitement and suspense. While I mentioned already how the film saved New Line Cinema, on a $1.2 million dollar budget, it brought in over $25 million in the box office, making it a huge success and allowing more films to happen. Final Ranking: I am still waiting for a horror movie to create some real fear and anxiety for me. While there were some scenes of Freddy jumping out that gave me a slight surprise, I still am wanting more. Perhaps my expectations are too high - but as I mentioned last week, I feel I have seen other movies not in the horror genre that have given me more fear and anxiety than these films. However, I can certainly understand why Freddy Krueger is iconic and I found the film to be fun with some suspense and it kept me entertained in its entire duration. This film scores a…..
Don’t forget to listen to my podcast every Monday (Last Action Podcast) with LPJ and I hope you consider being a patron on patreon at patreon.com/gamezillamedia. For October, our patrons get a special podcast only for them as LPJ and I discuss the career of legendary director John Carpenter.